Hostgator is a very well known hosting company which has been serving the services for thousands of clients, and could be way more than that but who cares about the numbers when you are getting to know that those customers are not being served the way they deserve it after paying so much and having their web property hosted at a place where nearly half of the world isn’t able to access the website on time and that makes the customer lose the potential visitors and clients. In the review below, I am listing out the issues I have been facing with Hostgator, but keep in mind, these are my thoughts and you might one of the lucky customers of them who hasn’t faced any problems with them till date. Still, I have you in my mind while writing, so that you think of alternatives any time soon. Long wait time – There are several instances when I had to wait for at least 45 minutes for a person to get free and start taking my queries, and to make it worse, as soon as you are connected finally, you would see the chat screen with no response and you have no option but to try it again from the very beginning. Several other hosting companies do not have a live chat option but they reply within a few minutes itself. Repetitive answers – The customer care guys don’t have any other answers than the standard ones, and when we prompt that it’s not the issue our side, they blame the ISP but don’t accept the blame on themselves, although the end problem is all because of them. Me: I have done that hundreds of times and you always repeat the same answer. I cleared the cache, tried from another browser too, asked a friend to check it from his place (South Africa) and another from US. No one is able to open the website. Hostgator: I would then suggest you to contact your ISP because they could have possibly blocked the access. Me: I did even that. They said they don’t even block adult sites unless someone reports, and in my case for my blog, they don’t have the URL in the block list. 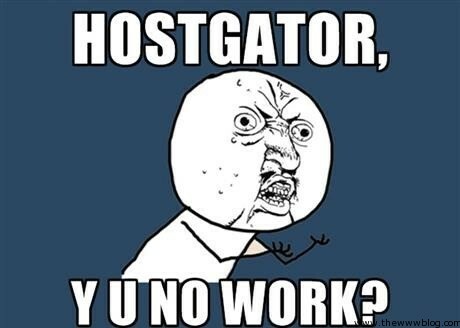 Hostgator: From our side, we cannot do anything else to resolve this. I will open a support ticket with your complain and you will receive the support through the email from here. Oh thank you, I will now have to wait for a week to see the same reply as you gave. WTH? every guy around who isn’t able to open my website has to go contact his ISP and check whether they intentionally blocked the website? is that what my visitors would do when they directly land here from a search engine search?!? When I searched around my network to see if people are facing some similar issues, I found I wasn’t alone. There is a big group of bloggers who have shifted to several other web hosts and this was even worse when a year back a couple of my friends had shifted to BlueHost mainly for the reviews it has always got. But in August this year, finally we got to know that these both are under the same group – Endurance International Group, something which owns around 50 web hosting companies now after buying each slowly and steadily to become this big, but that didn’t matter earlier until the huge network outage happened and EIG posted about it. That is when one got a feeling that buying a hosting plan with any of these could lead to the same problem in the near future. How all this affected me? If I thought it seriously was a problem with my IP and Hostgator is a big company, and they shouldn’t be blamed, I was totally wrong. My rankings in search engines started changing, and the hosting is seriously one of the reasons why it happened. Downtime, delayed page response and what not, everything is taken into consideration by Google. And eventually, I am totally unsure of how much traffic and final earnings I lost during this time, with some serious damage to the rankings. The worst time was recently when I had shifted the website to a friend’s server and whenever I try to open the website, it says “Account suspended”. That doesn’t show to only Hostgator and a few people who I cross-checked with but my clients who have placed ads on my sites, mailed me to ask what is the issue with the site. All thanks to Hostgator. What else is not good with them? The affiliate system is more crappy! I tried them and only for once out of eight signups, I see the commission approved, i.e. 12.5% conversion off signups. And at a serious note, I have seen three websites already running a week after the signups happened, but Hostgator never counted them and set them as Inactive for always in my affiliate panel. One of my friends, Ricky Shah, posted a picture of his experience with it. This one below would explain everything to you. Is the condition same with Shared and Dedicated accounts? I am not sure of these, because I know a couple users who have dedicated accounts and the support system for them is quite better I suppose, because of the money they pay. Shared, well, is “Shared” where I won’t risk hosting my website along with some unknown sites on the same IP, and these could do some serious damage in the eyes of search engines. I have used only their reseller plan, thus sharing my experience only with that. Sunny Bajaj: Using a Dedicated server.. and no response for days WRT tickets. Sachin Kumar: I am using hostgator from past 5 years. dedicated and VPS are not good at all. but if i tell you about shared Awesome. No other host can provide you service like HG. I have proof HG can handle too much traffic. yes, Agree there is some issue with HG these days. but the main reason is shortage of Resources. They are growing very very fast. If you are someone new or someone already fed up with some other hosting service, don’t risk it with Hostgator for now. They won’t respond well, they would keep replying with the same answer if they don’t have a clue of what is happening, and they are not trustworthy anymore. There are several hosting companies that are emerging and that take care of their clients so well, and although they won’t have the tempting live chat option, they respond to tickets in a few minutes. I was happy with Hostgator at one point of time, but eventually they have become average to bad to worse. For now, I won’t recommend them. Mostly it’s the webmasters who complain in the various discussion forums but Bloggers didn’t mention about Hostgator a lot although there were several issues faced by many users. I have been using Hostgator from past 6 Months and faced some problems with hosting they use to suspend account temporarily and Send email that, script that your using is causing problem. Hostgator can’t handle websites with high traffic. That is what I was mentioning about – throwing the blame on the customer itself! I have personally never used Hostgator but I have seen literally 17 friends of mine who were using hostgator and shifted to another host. Hostgator has really been sucking since 6 months now and I am very glad I never bought hosting from them. I do not recommend this hosting even if they are giving me the the top plan for free. If you are a blogger with a website with high traffic avoid hostgator they can’t handle high traffic and give lame reasons with the worst customer support I have seen. Good thing you have been away from Hostgator. Several newer companies are better than this for now! That’s the problem with them. The same repetitive answers from the staff, and here even the senior technical staff isn’t responding to solve the problem. You can not expect high class service quality for a shared hosting. besides the companies like hostgator, godaddy are for the name sake and when it comes to service quality they deserve a big Zero. It’s a reseller and I am paying much higher than for the shared hosting, and I expect a little better response. I am pretty happy with the other hosts right now, and yeah, these big names are just the “names” right now. Omg!. i couldn’t stop laughing. you article is fun to read.Your picture is hilarious..i didn’t expect a bad review for hostagor. but you are quite right their live chat does not work, it’s like you are talking to robot. they just dont solve the problem always”i will replicate your issue to our expert , you will here from us within 3 hours” oh my!